Set up your kettle for indirect normal fire cooking method, using approximately 25 barbecue briquettes in each charcoal basket. Light the fire-lighters and move the charcoal baskets to the centre of the cooking grill over the flames. With a sharp knife, cut the rind around the pork, around the knuckle and down the centre to free it on all sides, ensuring that you have cut right through the rind to the fat, but not into the flesh. Approximately 35-40 minutes after lighting, all of the coals will be ashed over and ready for cooking. Separate the charcoal baskets using tongs. Place foil drip trays between the two fires- must be large enough to catch all of the drips. Place the cooking grill on the barbecue with the grill handles directly over the fires. Place the pork onto the cooking grill. Close the lid, ensuring the air vents are open and positioned over the indirect zone. Cook for 2.5 hours to blister the skin. 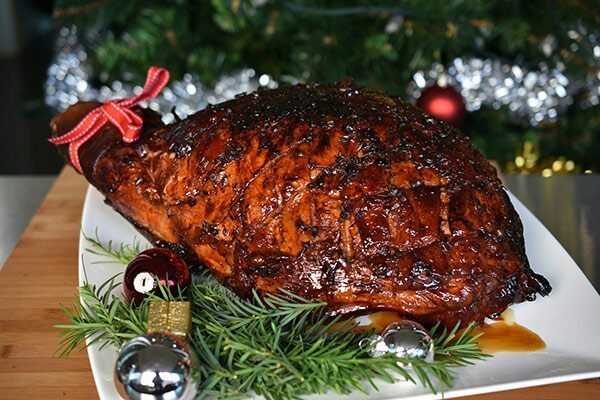 Once the ham has cooked, remove the ham from the barbecue and allow to rest for 15 minutes before carving.